Phil Leinhart is the head brewer at Brewery Ommegang. Devoted to brewing Belgian-style ales, Brewery Ommegang in Cooperstown, NY, was founded in 1997 by Don Feinberg and Wendy Littlefield, in partnership with three Belgian breweries. Duvel Moortgat, brewers of Duvel golden ale, has been the sole owner of Ommegang since 2003. 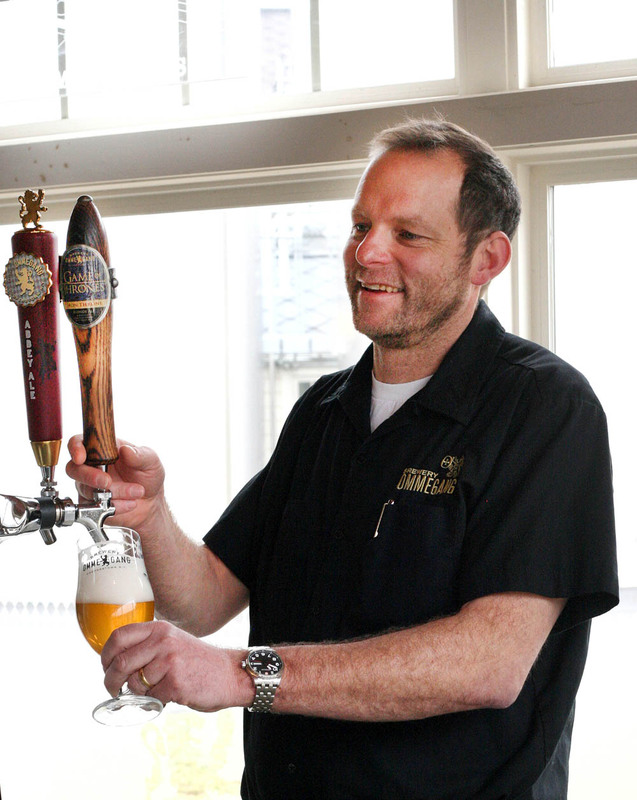 Phil Leinhart became head brewer in 2007, and has presided over steady expansion at Ommegang in the years since. AAB: You’ve been brewing a series of beers inspired by HBO’s Game of Thrones. How did that project come about? PL: HBO has an office in New York City near Times Square. There’s a Belgian café down there called BXL where we’re very well represented—not only Ommegang, but also Duvel. I guess people from HBO frequent this café and they fell in love with our beer. With the Game of Thrones series, the idea occurred to them of our brewing beer under some sort of licensing agreement with the show. We’re Belgian-inspired, and a lot of our imagery and symbolism is medieval in feel, so they contacted us. It’s been a process of going back and forth, and now we’re under contract to do a total of four beers. [The second beer was released in October.] Tell me about the new beer. PL: I can tell you now. HBO is very strict. We’ve known what the beer would be for quite some time, but we couldn’t say anything until it was official. I didn’t want to end up in Ommegang jail! We want the beers to tie in with the show in some way, either with the storyline or characters. Also, with the first beer, we knew some people would be trying this it who’d never had any of our beers before, so we didn’t want to come out with a knock-you-over 9-percent abbey ale or something like that. Iron Throne Ale was more delicate, not so high in alcohol, a little more accessible in that way. The inspiration was the Lannister queen: she’s very beautiful, seemingly sweet on the outside, but pure evil on the inside. The beer is fairly innocuous, pale golden: we used some honey malt so it has a certain sweetness to it, but we added some spices such as lemon peel, to give it a bit of a bite, too. The second beer is kind of the opposite—it’s sort of a Belgian Russian imperial stout, for lack of a better term. The grist bill is similar to an imperial stout, and it’s fermented with our house yeast to give it a nice Belgian, estery, spicy profile. The name of the beer is Take the Black Stout, which ties it to the show. There’s a north wall that protects the kingdoms in the south from the north, which is a perpetually frozen land where the White Walkers live, these scary characters. The men who stand watch at the wall to protect the empires to the south swear an oath called Take the Black. That’s fun. You don’t often get to take your inspiration from a work of fiction. PL: Yeah, it’s a new way to think about formulating a beer. We still think of beer lovers, so we strive for something with balance, but it’s interesting to take your cues from something like that. I look forward to tasting Take the Black Stout. And I guess I have to catch up with the series on Netflix before your third release. Tell me a little about your brewing background. PL: I’ve been in the brewing industry since about 1986. I worked for Harpoon, my first actual job was Manhattan Brewing Co. in New York City, one of the first brewpubs in the country—they opened in ’86, I think. I was in Germany for a little bit; I studied over there and worked at Paulaner. Then I worked for the Lion Brewery in Pennsylvania for five years, and I worked at Anheuser-Busch for 12 years. I’ve been here at Ommegang since 2007. So I’ve kind of run the gamut. From the smallest brewpub to the biggest brewer in the world. PL: I always wanted that experience. Companies like A-B—not so much now, ‘cause I think InBev drove all the knowledge out—prior to that, the company was so deep in expertise and knowledge and know-how. You’re working with people who’ve been in the industry for 40 or 50 years, they’ve worked all over the world, and they’ve seen every possible problem you can have at a brewery. You’re exposed to a different level of process control, how to make a beer that is consistent, that level of engineering and quality control. They have two-million-dollar labs that can analyze any aspect of a beer you want to analyze. My time there was very valuable. Your arrival at Ommegang in 2007 coincided with a big expansion in the number of beers, with a seasonal program and special releases. Was that your doing? PL: Yes, largely. I really expanded the size of the brewery, installing more tanks and auxiliary equipment. And working with Simon Thorpe—he came a little bit after me, but he brought a lot of energy to expanding the product line, so I’d say that both of us had a lot to do with it. I believe BPA [Belgian Pale Ale] is the only addition to the year-round line-up Don and Wendy established. Tell me something about the limited release program. PL: There’s a whole committee of us. We have an innovation program; we have Mike McManus, who was a staff brewer when I came here. I moved him over to be innovation manager. Putting some real clout behind that has allowed us to come up with all these beers at a rapid pace. That’s something I can’t do by myself. I oversee a lot of things, but I need people who can drive that program. How many people do you rely on at the ground level? PL: There are nine brewers. I’m running production, while Mike is working solely on innovation. We just put in a wastewater treatment plant. In a rapidly growing brewery like this one, you really need a team of people to execute everything. PL: Our output changes from year to year, but our capacity right now is about 65,000 barrels. This year I expect we’ll do close to 45,000. When I came here, it was about 6,000. I know that Duvel owns Ommegang in its entirety, and also owns Achouffe. I believe you’ve done collaborative brews with both Duvel and Achouffe. PL: With Duvel, Achouffe and also with Liefmans, one of Duvel’s recently-acquired breweries. So, these are collaborations across the extended Duvel family. PL: Yeah, it’s a lot of fun. I get to go over to Belgium, and collaborate over there. It helps us out a lot to have the technical resources and support of a company like Duvel. They’re much larger than us, with more technical capabilities. What is the day-to-day relationship between Duvel and Ommegang? PL: They’re very involved in our business plans, and any capital projects. But they don’t micromanage, in terms of what we’re brewing. Typically, the brewmaster at Duvel, Hedwig Neven and the head of QC will visit here about twice a year. We review capital projects, and taste all of our beers, but they don’t manage how we formulate our beers, just any big dollar investments. Is Ommegang beer on sale in Belgium? PL: No. There has been some talk of that. I guess there’s some interest in Belgium, but we haven’t done that yet. I’d be interested in the response in Belgium, because some Ommegang beers—though Belgian-inspired—are going in slightly novel directions. PL: I think you’re seeing that in all the traditional beer countries—England, Germany, Belgium. That’s where American brewers got their original inspiration, but we’ve kind of done something different, and I think they’re starting to look at themselves in the mirror. Some of the ideas that have started here are moving back to those countries. Most obviously, our heavier use of hops. PL: Absolutely, and different types of hops. Do you think Ommegang was influential in Duvel Tripel Hop? PL: Through the ownership, perhaps. If Duvel hadn’t owned Ommegang, Hedwig Neven probably wouldn’t have been coming here every year, tasting beers here, the American beers with different varieties of hops. I always think of the Ommegang beers as some of the most culinary beers. PL: Yes, that goes right back to Don and Wendy, no doubt. And it’s the Belgian tradition, too: cuisine alongside beer. Any other limited editions to watch for? PL: We’ve brewed a 100 percent Brettanomyces beer, called Wild at Heart. It doesn’t just use Brettanomyces for refermentation in the bottle: there’s no Saccharomyces at all. You don’t use Brett very often, do you? PL: No, we’ve played with it in the past in beers such as Ommegeddon and Bière de Mars, which were processed in a way similar to Orval, with Brettanomyces in the refermentation. But this is totally different, and you see more and more people trying this—Chad Yakobsen at Crooked Stave, most of his beers are 100 percent fermented with Brett. Theirs are wood-aged, fermented in wood, whereas we don’t have barrels or anything like that. But this is a unique beer, so we’re excited. What are the constraints in dealing with an all-Brett brew? PL: It’s a slower-metabolizing organism than Saccharomyces, so it takes longer to attenuate the beer. Then the obvious thing, if you’re also brewing beers with Saccharomyces, is to keep the two separate! If you’re handling both yeasts in the same brewery on a day-to-day primary fermentation basis, you just have to be very careful. But it’s been pointed out by people that Brettanomyces is not a “super yeast”: if you use good sanitation practices, it’ll be killed.